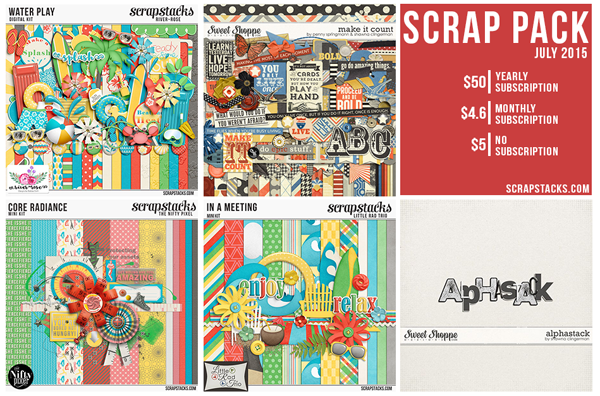 Every month Scrap Stacks offers a great bundle of kits anywhere up to six of them for a teeny tiny price of $5. This helps raise the funds to keep the wonderful Scrap Stacks Gallery up and running. If you haven't heard of Scrap Stacks then ya gotta go and check it out. It is an awesome gallery much like Pinterest but solely for all your crafting projects and DT work. Often my traditional scrapping friends ask if they can create accounts there too...yep you sure can. It is an open gallery for all crafters and is a fantastic way to collate all your projects into specific albums. I love this platform because it enables me to catalogue and share my scrapbooking and my digital designs all in one handy place. This way I can easily direct people to specific collections with ease and hey anything that is uncomplicated has my vote! The Scrap Packs made available to you every month are great value for mulla. They might include alpha packs, templates packs, journal cards and kits depending on what the featured designer chooses to create. They are all colour coordinated so as to be easily combined to create countless projects. 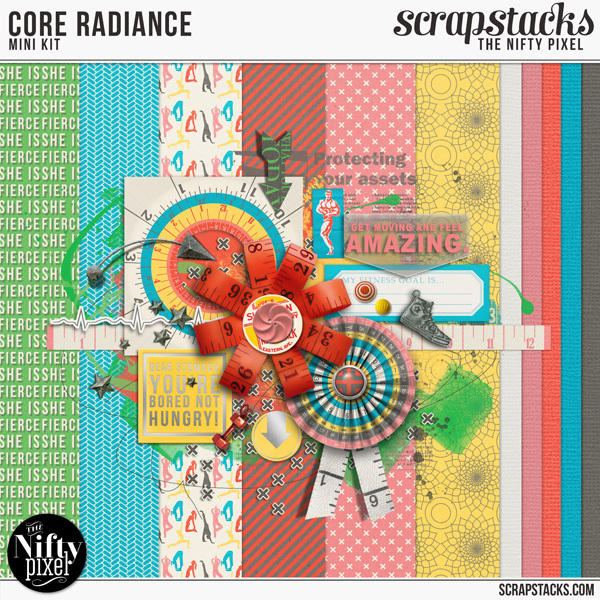 This month I contributed a mini kit called Core Radiance. Its all about moving them there bones of yours and getting some exercise, sunlight and fresh air. Here is a closer look at my contribution. I hope you'll check Scrap Stacks out and give it a go. Its a great way to get some scrapbook inspiration and most importantly share your amazing creations with others. Have fun Scrapping and keep on Stacking!